Instead of using ricotta cheese in your lasagna recipes, you may decide to use a lower-fat option such as cottage cheese. Choose small curd varieties to sneak into your lasagna dish. Additional options that you have for your ricotta cheese substitution include goat cheese, silken tofu or pot cheese. 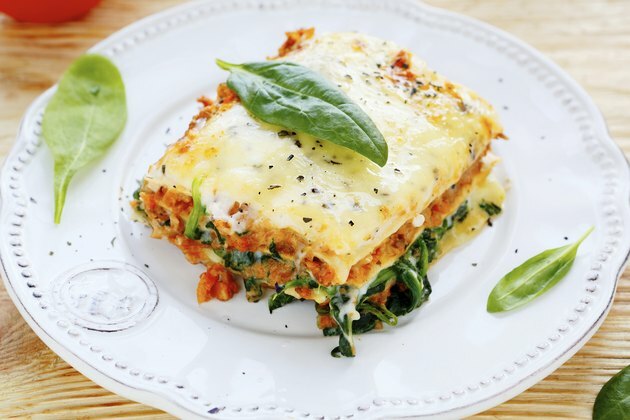 Because lasagna is made up of many other ingredients, a healthier substitution should not greatly alter the taste of the dish. Boil the lasagna noodles as directed on the package. Once noodles are al- dente, rinse and set aside. Spray a casserole dish with nonstick cooking spray. Lay the lasagna noodles side by side to cover the bottom of the dish. Spread your cottage cheese substitution over the top of the noodles. Use the same amount of cottage cheese as you would the ricotta cheese. Cover the cottage cheese layer with your choice of sauce. Tomato sauce is an acceptable option, or you can use a sauce flavored with ground beef or sausage. Sprinkle the mozzarella cheese over the sauce and cottage cheese. Begin another layer by laying the lasagna noodles over the mozzarella cheese. Repeat the process for a total of three to four layers. Finish off the dish with a generous amount of mozzarella cheese. Bake the lasagna uncovered in the oven for approximately 30 to 40 minutes. The lasagna and cheese should be bubbling before you remove them from the oven. Allow the lasagna to cool for approximately 10 minutes before cutting into squares. You’ll use the same amount of cottage cheese, pot cheese, silken tofu or goat cheese as called for ricotta cheese in the recipe. If you are concerned about the fat content of lasagna but still wish to use ricotta cheese, purchase part-skim varieties over whole milk versions.